Queen Elizabeth II, who recently became the longest serving British and Commonwealth monarch, once used an RCAF flight to upstage U.S. president Ronald Reagan. "I was flying Her Majesty in a turbo-prop Cosmopolitan aircraft in the Windsor area in 1984 when a royal aide asked me if I could get a written message to president Reagan," says Edmonton's Brig.-Gen. (Ret'd) Bill Buckham. Interviews with the party leaders on CBC's The National revealed a sharp difference of opinion about Canada's military role in fighting ISIS in Iraq and Syria. Canada joined the U.S.-led coalition to combat ISIS, also known as Islamic State or ISIL, last year. The mission, Operation Impact, includes six CF-18s, an aerial refueller, two surveillance planes and about 600 personnel involved in the air war, as well as 69 special forces training Kurdish fighters. Thousands of people flocked to the Parry Sound Area Municipal Airport recently to take part in the 12th annual Fly-In and Drive-In. Despite inclement weather in southern parts of Ontario, which resulted in some aircrafts not being able to attend the Fly-In, attendees and airport staff were more than happy with what they dubbed a Fly-In success. An aircraft from the Canadian Warplane Heritage Museum in Hamilton was clearly an event highlight, a B-25 Mitchell bomber, which was routinely in the air providing willing attendees with historic flights. A recruitment drive is well underway for local cadet squadrons, and for youths interested in flying, the Windsor Regional 106 Air Cadets is looking to help them soar. The Windsor Regional 106 Air Cadets has been helping youths increase their knowledge of aviation since the local squadron was formed in 1942. Capt. Chad Williamson, the training officer with the local air cadet squadron, went through the cadet program in Ontario and has been involved with the local squadron since 2004. He highly recommends the group for kids between the ages of 12 and 18. RCAF veterans and representatives of the U.K., Poland, the U.S.A. and France commemorated the 75th anniversary of the Battle of Britain at Stanley Park's Garden of Remembrance in Vancouver, B.C., recently. The 4 Wing Air Show may be returning in 2016, and the base wants the City of Cold Lake to serve as their primary sponsor. 4 Wing Commander Col. Eric Kenny shared the proposal and project outline with council during their recent meeting. "I really enjoyed the 2014 air show and I think it would be great to go ahead and do the 2016 air show," said Kenny. "I believe it would be good for the Royal Canadian Air Force to display what we do on a daily basis and at the same time to work in partnership with the City of Cold Lake to hold the air show." DARPA has conducted an experimental demonstration of a new robotic landing gear system near Atlanta, offering helicopters with the ability to land on and take off from angled, irregular and moving surfaces. The new system will be able to replace standard landing gear with four articulated, jointed legs, which can be folded up next to the helicopter's fuselage while in flight. BAE Systems has begun night trials on the Striker II helmet-mounted display, the company's most advanced fighter pilot helmet, to evaluate its digital night vision capability. Successful trials will lead the way to a fully integrated digital night vision helmet, replacing the need for traditional analog night vision goggles. Developed and tested by BAE Systems, Striker II is a fully digital solution that provides today's combat pilot with exceptional night vision and target tracking technology. Registration is now open for the Snowbirds 45th Anniversary Reunion to be held in Moose Jaw from Oct. 8-11, 2015. Team Alumni, Honourary Snowbirds and Associate Members of the Snowbirds Alumni Association may register here. All details pertaining to the reunion, including cost, hotels and travel arrangements are available online. Former team members are also requested to send their contact details to the Snowbirds Alumni Association at snowbirdsalumni@gmail.com. Registration closes on Sept. 25, 2015!! 1 Air Division (Europe) Reunion 2015! Registration is now open for the 1 Air Division (Europe) Reunion 2015 at the beautiful Tigh-Na-Mara Resort in Parksville, B.C., on Oct. 30-31, 2015! Come and celebrate with us at a destination reunion on Vancouver Island! Former 1 Air Division personnel and their children are welcome. The CAS2015 Organizing Committee is proud to announce that program for the 2015 Canadian Aerospace Summit is now available! Held under the theme The Sky is the Limit, conference presentations will provide Canadian and international perspectives on the future of the industry. Featuring speakers from companies of all sizes and sectors, the program is sure to provide you with new insights and opportunities to grow your business. Early-bird registration deadline is Oct. 16. Don't miss out on the opportunity to save about 15 per cent on the standard rates. 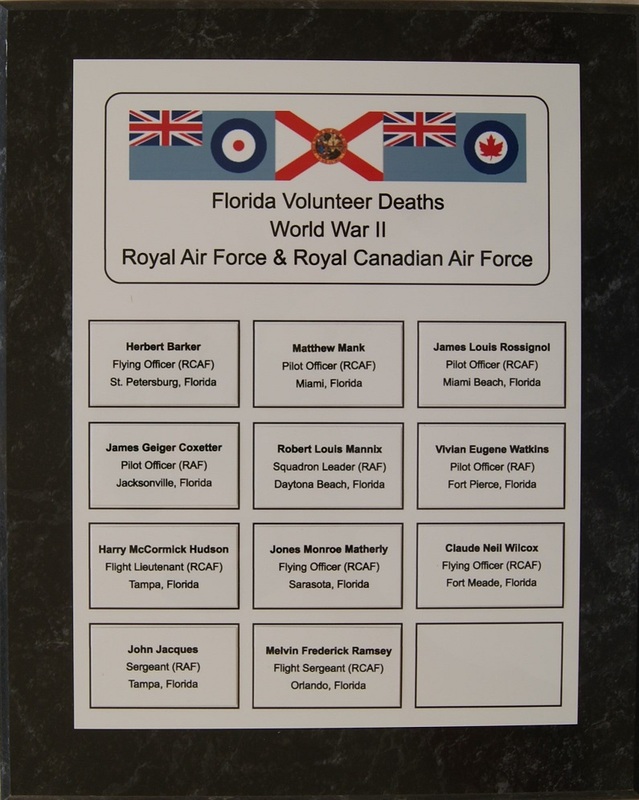 It is my hope that fellow RCAF Association members in the Clearwater and Tampa, FL, areas can join us on Jan. 11th, 2016, to honour those Floridians who volunteered with the RCAF and RAF during the Second World War. The Royal Canadian Legion Post 144 plans to host the event during their meeting at the American Legion Post 7 facility in Clearwater, FL. Canadian Forces personnel from around Florida will attend. Karl Kjarsgaard, who is a Board Member of Bomber Command Museum of Canada and the Director of Halifax 57 Rescue (Canada), will be speaking and displaying Bomber Command Museum's transportable memorial. We will also have representatives or members of the Civil Air Patrol (U.S. Air Force Auxiliary) and Florida Aviation Historical Society. Hopefully, RAF, USAF and other officials will agree to attend. The building's occupancy capacity is 225 persons. The two plaques that will be dedicated can be seen here and here. 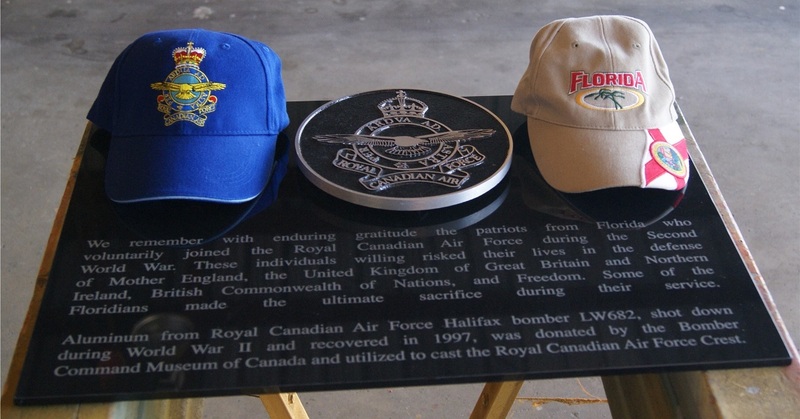 Note that Halifax 57 Rescue (Canada) donated the aluminum for the RCAF crest. The metal was obtained from a downed Halifax bomber. I will update everyone again once additional details become known. Mr. Dann Oliver (RCL Post 144 & RCL Eastern Division, U.S.A.) and I are planning and coordinating.